Earn $48.45 in Rewards credit (4845 points) What's This? Cannondale's 2019 Supersix EVO 105 Road Bike is pure race performance -- an ideal balance of weight, stiffness, aerodynamics, and smooth-riding compliance, with the traditional simplicity of rim brakes. Frame: BallisTec Carbon Frame, SAVE. Fork: BallisTec Carbon, SAVE, integrated crown race, 1-1/8" to 1-1/4" steerer. Crankset: Cannondale Si w/ FSA rings, 52/36. Cassette: Shimano 105, 11-28, 11-speed. 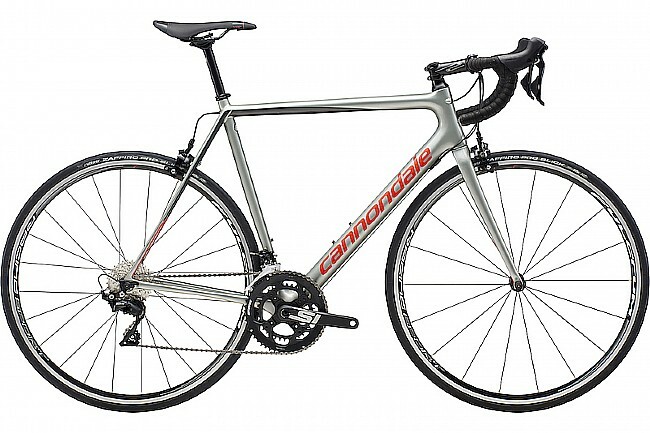 Handlebar: Cannondale C3, Butted 6061 Alloy, Compact. Stem: Cannondale C3, 6061 Alloy, 31.8, 6 deg..
Saddle: Selle Royal Seta S1. Seatpost: Cannondale C3, 6061 Alloy, 25.4x350mm (44-56), 400mm (58-63). Tires: Mavic Yksion Elite 25c. Manufacturer Warranty: Lifetime for frame; 1 year for components.